Specifically designed for easy transportation and storage. 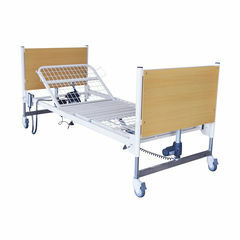 Ideal for shorter term care or use in a homecare situation. Electric Hi/Low, backrest, kneebend, and manual vascular support. Electric forward and reverse trendelenburg. 100mm braking castors and transport frames included.